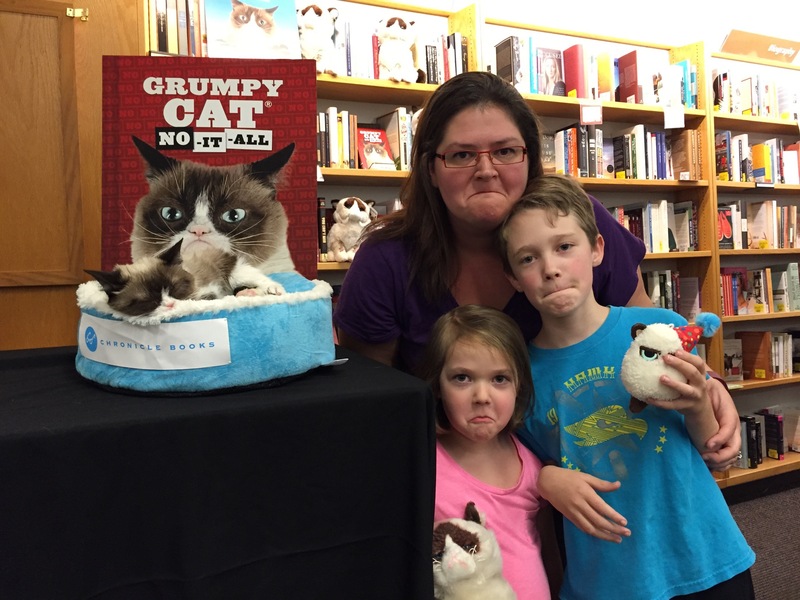 “Go see Grumpy Cat!” The voices in my head shouted at me. No? Don’t have kids, then, do ya? On what planet do the children immediately recognize the Cool factor of mom? Pluto, perhaps-oh wait, cant be. It all started well enough..as do most horror stories. I knew we’d have to arrive early based on my stalking/following GC on twitter. Despite knowing about the long wait and what happens to children after a long wait – a monster metamorphosis – my mom decided to go with us also. The kids were fine, we played and checked out the children’s section, got a snack, and headed to the already-forming line. We had shiny new Grumpy Cat books which did keep them entertained for a good 30 minutes. After a bit, a local news crew started seeking out people in line to interview. As any mother with perfectly created children do, I naturally expected her to come over and speak with my cherubs. Not just because they were the only children under 13 there, but because they are adorable and charming. I saw her interview the actual stalker, who had just the previous night been retweeted by GC as having shown up for the Oregon book appearance, and was now numero uno in line in Seattle. Next she spoke to the tattooed purple-haired middle aged woman ahead of us, and then finally the meth head with the admittedly bootleg “Chinese ripoff” t-shirt right beside us. As the host and camera guy stumbled over outstretched feet towards us, I expectedly waited to be asked to interview “some kids” as the camera guy had pointed out. The reporter whizzed right past us, however mumbling something about “that cute kid” a few aisles behind us. I glanced at my mom and we both agreed my kids obviously didnt fit the misfit clan they were set out to showcase. Fine by me! After one dead DS, and 2 low battery iPhones, it was finally time! Someone saw something happen, so everyone stands up and squeezes together. False alarm! 10 minutes to go and the media gets their turn with The Grumpy Cat. Gramma got irritated, and the kids decided an hour was faaaar too much time to get along so they began pushing/poking/anything annoying a bored kid in line does. 15 (of the longest painful) minutes after the initial start time, the first person is let through. Huzzah! 2. Hand bags/purses/whatnots to stranger #1 who passes it down a line to greet you after your photo. 4. Hurry and go!go!go! CollectyourshitandMOVE! Thankfully I noticed my son actually turn his head and look at Grumpy Cat for half a second. I dont think my daughter got to see her “in the fur” so to speak. I moved in next for the group shot, turned to the sleeping talent and said, “Bye Tartar Sauce!” (Her real name) and she cracked both eyes open just long enough to freeze me with her grumpy lasers and then immediately shut them again. Our crap was shoved at us and we moved to the ‘swag table’ which was stickers and pins. “Thanks for giving my 5 year old a weapon.” Who uses pins anymore?! Still, all things considered, it went well…until we get home. So in time, I hope to look back and appreciate this day where I spontaneously decided to treat my kids to a school night adventure. I’ll be the only one appreciating it or even remembering it, naturally. Next time i’ll save the gas and just get a labotomy.